Wow, very beautiful work ! Thanks Sonali!! I really appreciate it!! Thanks Lesa! I highly appreciate your encouraging words. 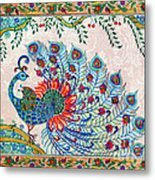 I feel really happy that you visit and comment on my peacock! Joy is a peacock-it's beauty so rare; A rainbow of colors that vibrantly flare. After the rain, brightly they come out. Into a fan-like form, uniquely it creates; Never forgot, this vision, joyfully it illuminates. Bringing such happiness and peace my way; All because a "little birdie" came my way! 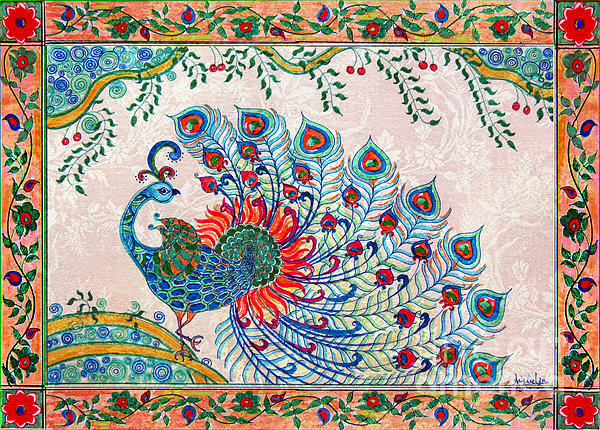 -Jamie Lynn Ball, USA This peacock is inspired from Indian traditional art called 'Madhubani Paintings'. I have used vibrant colors and decorative elements to make it cheerful and chic. I used a traditional Indian border. 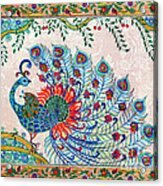 ....overall all together this peacock reminds those colorful, happy spring days in a very unique way!